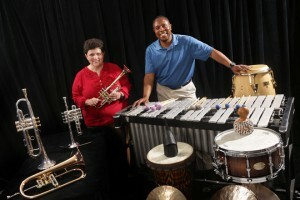 In the fall of 1994, the chamber ensemble Double Take, Dr. Sheryl Linch-Parker on trumpet and Dr. Don Parker on percussion, perform a blend of contemporary and traditional styles. Double Take provides a unique musical, cultural, and educational experience for audiences of all ages. With the exploration of different sound textures and colors, this ensemble has enticed its listeners with an intensity that reflects an honest approach towards new music that all can understand and enjoy. Double Take has had the opportunity to present workshops and perform professionally in North Carolina, Illinois, Texas, South Dakota, Colorado, Wyoming, Missouri, and Nebraska. Recently Double Take presented performances and clinics in March 2013 at Campbell University (Lillington, NC) for their Contemporary Music Festival, in February 2013 at Howard University, Norfolk State University, and Elizabeth City State University, in February 2012 at the University of Mississippi (Ole Miss), Alabama State University, and Bethune-Cookman University, and in May – June 2012 presented workshops on Chamber Ensemble Performance and Music Fundamentals for the Hoke County School District and Lenoir School District in North Carolina. The members of Double Take bring their vast array of experiences as performers and educators to the audience. Double Take has released a self-titled CD through PL Productions (DT001) in 2001. Double Take’s 2nd CD “Atmospheres” released in 2008, which features original works by Howard Buss and William Cahn of Nexus. Both CDs are available on www.cdbaby.com.